Another depiction of police brutality against a black man caught on tape, sparks outrage among black Canadians and the cycle of violence begins anew: a black person murdered by police is captured on video, the video goes viral and no changes are made to policing strategies or tactics. More importantly, no one is held accountable. Rather, the cycle of violence continues on an administrative level: SIU documents are concealed, police officers go unnamed; are seldom reprimanded and the victim's family and the black community never get justice. Renewed outrage followed the recent shooting of another black man, Charles Kinsley. This in the wake of the murder of Alton Sterling and Philando Castile in the United States. Meanwhile, in Canada, the Special Investigations Unit, a civilian law enforcement agency that only investigates incidents involving police and civilians, has launched an investigation after Abdirahman Abdi died yesterday, following a violent confrontation with Ottawa police. Witnesses say, Abdi, a 37-year-old autistic man was beaten by multiple officers while handcuffed, and laid unconscious for 15 minutes before paramedics arrived. A short video shows Abdi unconscious on the ground receiving CPR. He later passed away in hospital, 45 minutes prior to receiving any medical attention. The videotaped murders of black people have been consumed nearly as much as black culture itself. Police brutality against black people is not a new phenomenon. What's new is, technology has finally caught up -- camera and video in handheld devices has allowed truth to speak for itself. 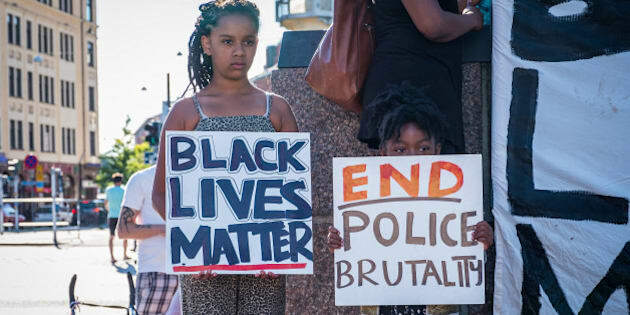 And now that we have seen and heard the truth; the existence of anti-black racism and state sanctioned violence against black bodies, what has changed? Not much. Rather the killing of black men and women has become sensationalized and this sensationalism breeds desensitization. The videos and vignettes of slain black bodies have been viewed millions of times. They are the main feature on prime time news; played over and over, a trauma we must relive again and again. Whether we realize it or not, these types of videos have become a (social) media phenomenon and not for their saliency but for their sensationalism. The videotaped murders of black people have been consumed nearly as much as black culture itself. State sanctioned violence against black citizens and anti-black racism continue to be ignored in Canada, discarded as an American epidemic that has no jurisdiction in this country. Each time a U.S. report of police brutality against a black individual is covered in Canadian news media, conversations resurge about "the American race problem." Thereby dismissing the lives of the dozens of black Canadians murdered by police. Alongside Andrew Loku, Jermaine Carby, and many others is now Abdirahman Abdi. The policing model and structure in this country must change. The taped violence breeds the same silence. Canadians are consumed with focusing on American racial contention, which allows them to ignore our racist past and to continue to position Canada as being only a safe haven for African-Americans, escaping slavery. Instead of having substantive discussions about how anti-black racism manifests in Canada, from the targeting of black people through carding, to the influx of black inmates in Canadian prisons, we tend to just ignore it altogether. In Canada, instances of police brutality parallel that which occur in the United States, particularly when dealing with mental health. The shooting of Charles Kinsley, an unarmed black man in North Miami, with his hands in the air, was the result of an emergency call for someone threatening suicide. Andrew Loku was fatally shot and killed in his Toronto apartment building; a residence known to house people with mental health. Abdirahman Abdi, said to be autistic, was fatally beaten by multiple police officers and later succumb to his injuries in an Ottawa Hospital. The policing model and structure in this country must change. Not only to address anti-black racism but to deal with the various intersections of oppression faced by black Canadians. Toronto Police Service former Deputy Chief of police Peter Sloly made some recommendations specific to what these changes should look like and politicians should take heed. While Justin Trudeau believes Canada may be devoid of "colonial baggage," we should all know better -- we've seen the footage.